The Minimum Wage Poster (Spanish) is a minimum wage law poster by the Florida Department Of Economic Opportunity. This is an optional poster, so while it is recommended that you post this if it is relevant to your employees, you are not required to by the Department Of Economic Opportunity. This poster, written in Spanish, is optional to post and describes what the minimum wage is for tipped and untipped employees and rights employees have to protect their right to get at least the minimum wage. It appears you don't have a PDF plugin for this browser. 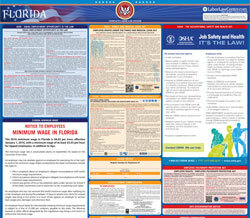 Please see the link below to download florida-poster-fl-minwage-2019-in-spanish.pdf. propinados , incluyendo propinas . con los requisitos legales de salario mínimo. recuperar los salarios atrasados, incluyendo daños y perjuicios,  y honorarios de abogado. mínimo, está sujeto a pagar una multa de $1,000 por cada infracción, pagadera al estado. civil para enforzar el salario mínimo. 448.110 de los Estatutos de Florida.